HX93B와 HX93BD 온도, 상대습도 트랜스미터는 원격 제어와 현장 모니터링에 적합한 제품입니다. HX93B 시리즈는 리니어 전류 또는 비례 전압 출력을 갖고 있습니다. 상대 습도 출력은 온도 보상 됩니다. 전류 출력 모델들은 측정 장비와의 거리를 확장시킬 수 있습니다. HX93BD 모델은 디지털 디스플레이로 상대습도와 온도를 동시에 읽기 편하게 표시해줍니다. 모든 모델은 고정밀 디지털 센서를 탑재하고 있고, 스테인레스 강 필터로 이 센서를 보호하며 이 때문에 청소와 유지보수가 용이합니다. 케이스는 NEMA 13 (IP54) 규격으로 견고하며, 설치 나사로 쉽게 현장 설치가 가능합니다. Wall mount temperature / Relative Humidity Transmitter, 4 to 20 mA. Duct Mount Temperature / Relative Humidity Transmitter, 4 to 20 mA. Digital Display Wall mount temperature / Relative Humidity Transmitter, 4 to 20 mA. Digital Display Duct mount temperature / Relative Humidity Transmitter, 4 to 20 mA. Remote Probe Temperature / Relative Humidity Transmitter, 4 to 20 mA output with 3 m (10') cable. Digital Display Remote Probe Temperature / Relative Humidity Transmitter, 4 to 20 mA output with 3 m (10') cable. Digital Display Wall mount temperature / Relative Humidity Transmitter, 0 to 1 volt. Wall mount temperature and relative humidity transmitter. 0 to 5 Vdc output. 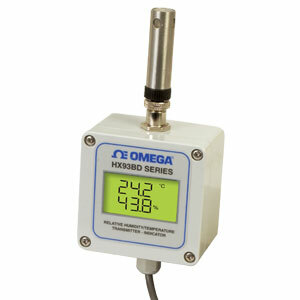 Digital Display Remote Probe Temperature / Relative Humidity Transmitter, 0 to 10 volt output with 3 m (10') cable. Wall mount temperature / Relative Humidity Transmitter, 0 to 1 volt. Duct Mount Temperature / Relative Humidity Transmitter, 0 to 5 volt. Remote Probe Temperature / Relative Humidity Transmitter, 0 to 10 volt output with 3 m (10') cable. Spare duct mount kit for HX93B Duct Mount and Remote Probe models. Porous Polyethylene Industrial Probe Cap, for wet environments, 10 pack. For external industrial probes only. 참고: Comes complete with Quick Start Manual.